Last night's Elimination Chamber PPV featured a lot of celebratory moments from Bayley and Sasha Banks winning the Women's Tag Team Titles to Finn Balor becoming the new Intercontinental Champion. 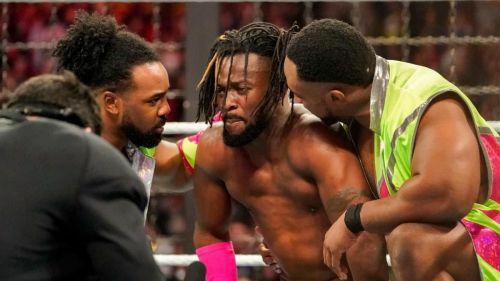 Most importantly, Kofi Kingston has had an impromptu career boost in a matter of a few days. Even if Elimination Chamber 2019 wasn't a perfect show from start-to-finish, it was good enough to prove that WWE doesn't need legends or part-timers to save the day once again. All they ever needed was to showcase some of their regular superstars with some great booking decisions to fulfill the expectations of the WWE Universe. If you recall, it seemed as if Bayley was pulling most of the weight when it came to Sasha Banks and her leading up to the Elimination Chamber itself. In a sense, we witnessed that there was some sort of a disconnect between the Boss 'N' Hug Connection. While that may have seemed confusing before last night's PPV, all of it made sense when it was Sasha Banks who took her team to victory in the end. This was a long time coming. Both of these women have worked hard to get to this point, and the emotional release following their win was pretty evident too, as even the commentary team (most notably Beth Pheonix) got swept in emotions if you noticed closely. Regardless, one could go on praising this moment throughout the entire blog, but let's save the praising for some other great moments that happened last night. One does hope that both Bayley and Sasha Banks find success in what's to come in the near future, including WrestleMania 35. Which team should challenge The Boss 'N' Hug Connection for the Women's Tag Team Titles first? Sound off in the comments section below.